If you are a Disc Jockey, it means that your responsibility is to spin what the people wish to hear: good music depending on the occasion and mood of the crowd. And to deliver the groove you will need some cool gear and pick headphone from Best DJ Headphones. Therefore here are the some of the best available headphones which will help you to hear the better sound and to more easily feel what people need. Other key features include lightweight construction, a foldable body, and rotating ear cups. High impedance is also recommended, especially if the headphones are to be plugged into pro-grade equipment. Dig in! To be able to make an informed and wise purchase, it’s important to have a good understanding of headphone. Three crucial things to consider when it comes to investing in a pair of headphones are its type, size, and technology. Even at its supreme best, the bass that’s produced by a set of cans can never match the mind-blowing and head-shaking experience you get from massive subwoofers or good speakers. What you need as a DJ is a pair that will cover your ears but not completely block the sound from the booth monitors. It is very important to bear in mind that the DJ environment is extremely noisy. Therefore, the first feature to consider is not necessarily the volume output, but the ability to block other noise. Read about Best DJ Headphones Buying Guide first, if you want to make a more informed decision first. The second-most worn high-quality headphones on this list are from Pioneer, a name synonymous with DJ gear. Pioneer DJ‘s HDJ headphone series is a workhorse: the HDJ-1000 and HDJ-1500 are popular models for both beginners and intermediate DJs. The Pioneer HDJ-2000 is a fantastic choice, and makes a great alternative to the HD-25s, especially if you feel more comfortable with an over-ear headphone. You have a comfortable fit here with leather which is all around. And what stands out the most, they have swivel earcups, big 50mm dome drivers, decent Ohms of 36, a carrying pouch, replaceable cables and ear pads, and have an easy use when you need to adjust the cups. Frequency range is quite broad at 5Hz to 30kHz and weighs around 11 ounces so it isn’t leggy at all. The headphones will deliver an amazing sound and there is no need to turn them up too loud because they will cancel the most of the outside noise. 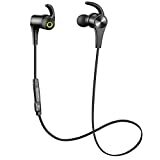 However, these are not soundproof, but the noise canceling is good enough for you to focus on what is coming from the headphone and not the outside world. Additionally, these are pretty loud phones so you can always attenuate the noise with the high volume. These are heavier than the Sennheisers, coming in at roughly double the weight! 10.2 ounces is still light, considering these are made with significantly more metal. These leads to them feeling heftier and some users say more durable. Great is the quality they give. It fits the perfect mold for best DJ headphones. Pioneer Pro DJ HDJ-2000MK2-S DJ, This headphone is among the top on many lists. Now, you might not see AKG Pro Audio K167 Tiesto DJ headphones as “convenient” headphones, but they’re definitely good. The design of these headphones is quite something – there are huge earmuffs that make the headband appear small. These large earmuffs are able to completely cover your ears, snuffing out all of the ambient noise while doing so. This ensures a complete music experience, as you won’t be bothered by outside noise. 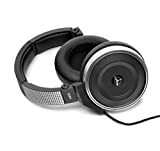 On that matter, AKG Pro Audio K167 Tiesto DJ headphones come supplied with a set of 1.6″ drivers which provide clear, full-spectrum sound output. Let’s get back to the design of AKG Pro Audio K167 Tiesto DJ Headphones. A special form of technology was used during the manufacturing process of these headphones – the “3D-Axis folding“. This allows for easy storage, as you can fold your headphones in virtually every possible direction. 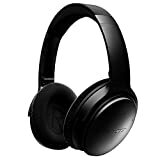 Lastly, AKG Pro Audio K167 Tiesto DJ Headphones come cheap. In fact, it’s quite a surprise that a set of bargain headphones can provide such benefits. All in all, these headphones boast quite a value for the cash. Sony MDR-V55 Red Extra Bass DJ headphones are Sony’s greatest budget headphones, without any doubt. The design of these headphones is beautiful, as it’s adorned with attractive earmuffs, a beautiful black band, and various other small parts. There’s more to design than just looks, though – Sony MDRV55 Red Extra Bass DJ Headphones boasts high levels of durability and reliability as well. On top of that, these headphones are very comfortable, mainly due to the fact that the entire construction focuses on providing just that. The earmuffs, for instance, are large enough to cover your ears, providing excellent noise isolation. Furthermore, they’re made of such materials that they feel gentle on the skin. 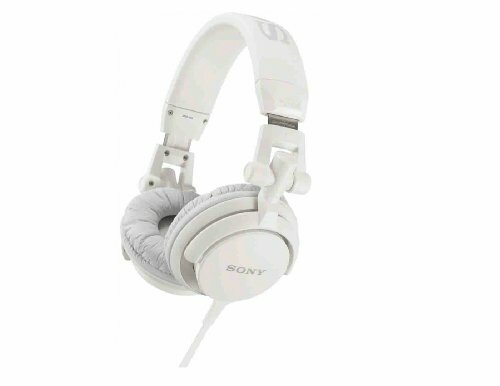 On top of that, Sony MDRV55 Red Extra Bass DJ headphones are very lightweight, weighing only 8 ounces. 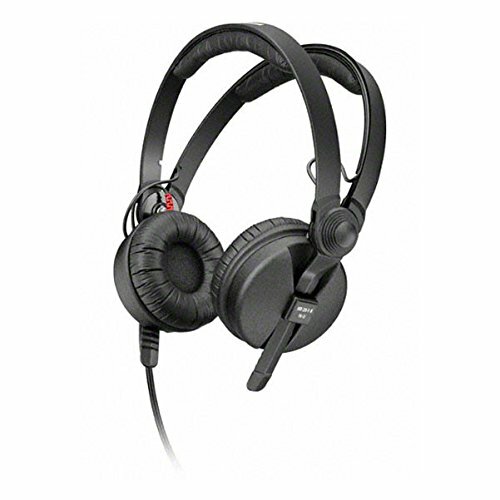 Anyhow, the price is one of the best benefits of Sony MDR-V55 Red Extra Bass DJ headphones. These headphones belong to the “budget” price point category, and they’re literally a bargain. Simply put, you can’t go wrong if you choose them. 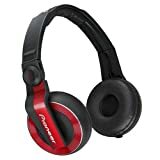 Pioneer HDJ-500R DJ headphones belong to the “affordable” price point category, but they are greatly superior when compared to most products in that price range. Why is that so? Well, the simple fact that these headphones offer a pleasurable experience at a bargain price could be one of the reasons. 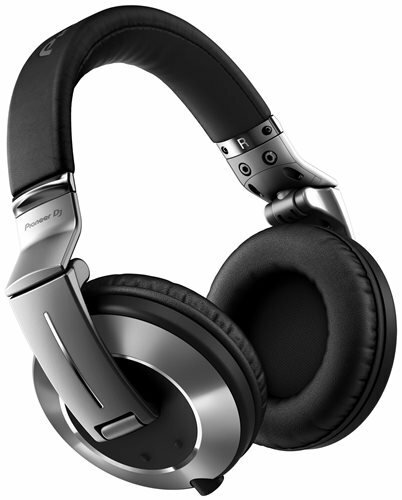 Plainly speaking, the design of Pioneer HDJ-500R DJ headphones is what makes them so good. The rotating design can swivel up to 60 degrees, and the padded ear cushions are both protective and very comfortable to wear. Another reason why Pioneer HDJ-500R DJ headphones are so good is their performance. It’s safe to say that these headphones are very reliable due to the fact that they’re made of top-shelf materials, including machined parts, leather, and hard plastic. There are 2 interchangeable cords of 3 meters that will allow you to move freely as you listen to your music. Lastly, these headphones come in three color variations – red, white, and black. Wrapping it up, Pioneer HDJ-500R DJ headphones are more than just valuable for the cash. They excel in nearly all fields of performance, they’re extremely comfortable, and, on top of all, they’re quite cheap. Bluedio U Plus Pro DJ headphones are next on the list. Now, these headphones are very interesting, mainly because there’s hardly anything “usual“ about them. 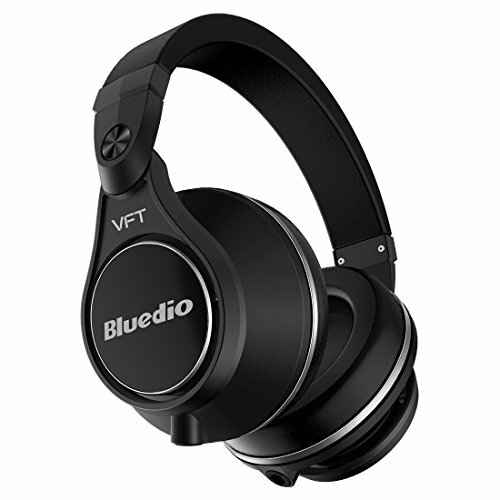 First of all, Bluedio U Plus Pro are over-ear headphones, but their design is everything but ordinary. The beautiful black combined with hard plastic, polished parts results in an exquisite outward appearance. Apart from the looks, Bluedio U Plus Pro boasts a high level of performance due to three PPS12 drivers. Furthermore, there’s a special feature that provides outstanding ambient noise reduction called Cavity Design. Now, this feature improves the overall bass response and helps to attain resonance. On top of that, the protector earmuffs provide outstanding durability and comfort. The reason more DJs use this headphone above any other is because they hit the mark on just about every point a DJ would care about. Sennheiser’s HD 25-1 II Headphones have become somewhat of an industry standard for DJs the world over. Revered by DJs and sound engineers alike, the original Sennheiser HD 25 (see complete review) has been the go-to on-ear headphones for many decades. This is a real masterpiece that will withstand the rigors of DJ use, and deliver really amazing sound. The Sennheiser HD 25-1 is an example of the classic and comes with extra velour earpads, a right-angled plug, and carrying pouch. There is also an extra coiled cable to avoid snags in the DJ booth. Due to their low weight and the option of one-ear listening, the HD 25 headphones are indispensable for mobile monitoring. Not only are they seen around the heads of the majority of famous DJs, because if you watch ESPN you’ll also notice these are the headphones of choice for well-known sports commentators for their ability to isolate from the background and ambient noise. The Sennheiser HD 25-1s are an on-ear style, which you might think wouldn’t provide the same isolation as over-ear headphones… but surprisingly, these block out ambient noise amazingly well. This is the big winner on this list. 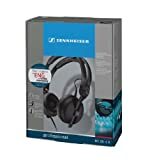 See more reviews of Sennheiser DJ Headphones. V-Moda has made quite a mark on the scene in recent years. It belongs to top of the many lists. V-MODA is well known Italian manufacturer of premium headphone that takes the last place spot on this list, with the most ubiquitous model used by DJs being the V-Moda Crossfade M-100. These are versatile headphones. If you take Beats, make the brand a more “underground” and a bit more geared towards the audiophile, you get V-Moda. If this sounds interesting to you, buy it from Amazon. If you spend some time looking at V-Moda’s marketing, the emphasis is on a blend of style and substance, and we’d say they very much succeed at this intersection. The headphones are mostly made of solid metal, the cables are tough and the hinge is collapsible. They look gorgeous. The headphones are a bit flashy and a bit edgy but still kind of traditional and refined. You will most definitely feel like you are wearing a piece of art. The microfiber ear pads and ergonomic design make these headphones extremely comfortable. V-MODA headphones have always been about the bass. This model is no excuse. The emphasis is on the bass again. But this time the headphones produce incredibly clean and detailed sound without distortion, even at the high volume levels. The headphones are capable of passive noise isolation. It is fair to say that they do not cut out the noise as good as the Bose Quiet Comfort but they will drown out most of the outside noise at the 75% volume. But they will struggle a bit in a louder environment unless you turn them up very loud. Whether plugged into your iPhone on the bus or into a DJM-900 mixer at Electric Daisy Carnival, these just work. They have the punchiness of some other great headphones, with slightly more warmth and presence. Just have a quick look at a number of amazing reviews on many sites. 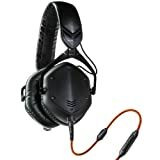 The V-Moda Crossfade M-100 achieves success as a Best DJ headphones because it is a great headphone in almost everything and it deserves to be on this list. These are extremely good headphones. According to Bose, the headphone is equipped with a new digital equalizing system that balances the sound, whether you’re listening to lower or higher volumes. The Bose QuietComfort 35 combines top-of-the-line Active Noise Canceling with Wireless Bluetooth operation in an extra-comfortable, fold-up design. With good microphones inside and outside of the earcups, Bose says the QC35 senses, measures and sends unwanted sounds to two digital electronic chips — one for each ear — that respond to a precise, equal and opposite signal in less than a fraction of a millisecond. The noise canceling technology can be a bit weird in the beginning and make you feel like you are in a pressurized cabin, but you will get used to it and appreciate the ability to listen to the music rather than the outside world noise. The sound is excellent for Bluetooth, and it doubles as a great headset for phone calls. Works in wired mode with included cord if a battery dies. Some airlines will restrict you from using Bluetooth headphones during portions of the flight, and a cord is necessary to plug into your seat’s in-flight entertainment system. That’s’ the one drawback of Bose’s upcoming QuietControl 30 in-ear Bluetooth headphone-it can only be used as a wireless headphone and has no corded option. When it comes to the design, not much effort was put in it. the 35s are almost identical to 25s. but the design is very good and there is no need for change. The outer shell of the earpieces is made of metal and the headband and the frame of plastic. They are covered in faux leather and they are very comfortable. Sony MDR-7506 Professional Headphones are ideal for any application where high-quality sound is necessary. This model is extremely popular among the professionals in recording studios because of its closed-ear design. The closed ear design is ideal for blocking the outside noise and that way you can achieve same clarity at lower volume levels. This way you are keeping your hearing undamaged. The quality of the sound on these headphones is just amazing. It is so good that you can easily pick the individual voice of every backup singer. The headphones have very low impedance, 24 ohms, and that means that it can be powered by any portable player and still achieve high enough volume level. The 1/4 inch adaptor is included so the headphone can be used both on your portable and non-portable devices. Both the plug and the adaptor are gold plated. 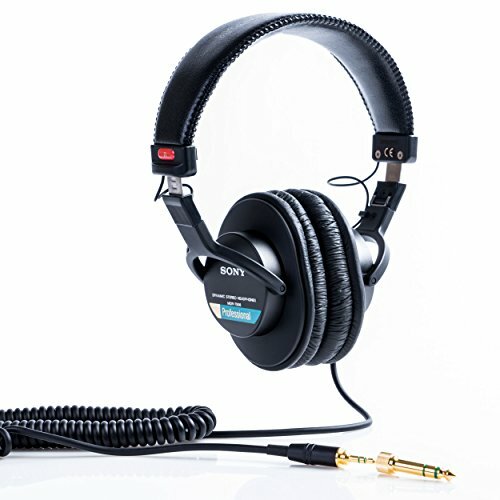 Sony MDR-7506 Professional Large Diaphragm headphones have an incredibly even response of the whole spectrum. They can also be used as a monitor headphone. There is no sound leakage so they will work very well. You will find these extremely comfortable. They are very light and equipped with the nice padding. The only disadvantage is that the opening for each ear is not very big and that some may not fit. Our advice here is to try them on before buying. The cable on these headphones drops out on the left side and it’s connected to the right earpiece through the head arch. We found this a lot more practical than the cable coming out from both sides. However, the cable is not detachable and that can be a problem sometimes. Sennheiser’s HD 8 DJ headphones are actually one of the best headphones from this amazing brand. As you might’ve already guessed it, Sennheiser is one of the world-class leaders in this particular branch of industry, and they’ve earned their salt with dominant technology and ingenuity. This model comes with a perfect elliptical over-ear design that maximizes comfort while retaining superior noise isolation properties. In fact, the ambient noise reduction technology implemented in Sennheiser’s HD 8 DJ Headphones is one of the best features of these headphones. Furthermore, you’ll like the part about the durability of HD 8. Simply put, most of the construction features metal machined parts that not only ensures superior durability, it also means that Sennheiser’s HD 8 is as reliable as can be. Last, but not least, the matter of the price. Sennheiser’s HD 8 DJ headphones belong to the “expensive” price point category, but don’t let that dissuade you. If you take into account all of the magnificent features Sennheiser HD 8 comes supplied with, you’ll find it extremely valuable for the cash. 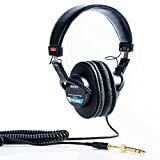 The main advantage of open-backed headphones is that often times, they tend to produce less distortion. Now if you’re an audiophile that’s keen on listening to your favorite songs on a top notch headset in a quiet and peaceful environment, this would be a good option for you. But if it is not the case the second closed type is an option. Closed back model is highly recommended mainly because they do a good job of blocking out any background noise. This is especially important when performing at a gig, as in order to line up the next track, you’ll need to be able to hear it well in the din of the crowd. It’s essential to cancel the background noise while mixing in the loud environment. Your budget is relevant also. 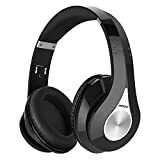 This is a big issue right here because I have seen a lot of solid and fine pairs of Best DJ headphones for under a bill, but some others that go even higher than average price is they give you superb quality. It all depends on how much cash you’ve got to invest in headphones. If you show up at a gig without at least one good trait of headphones then you’re in a mess because these are very important things for a DJ. DJ’s headphones are usually subject to quite a bit of abuse – they’ll be yanked on, accidentally stomped on, jammed in a bag in a hurry, have all kinds of stuff piled onto them… In short, they lead a hard life. That’s why it’s important you choose a model that has a nice, solid build and structure. In addition to this, you want to make sure the rest of the components are in fine condition. There’s a reason why, despite all the changes in DJ technology from analog to digital, headphones have remained a crucial thing in every DJ’s bag. Usually, the length of the headphone cable varies between 1 and 4 meters. The longest cable is not always the best option. You have to find appropriate length for your needs. Excess cable can sometimes weigh you down and get in your way while you are working. There are two types of cables for headphones. There are coiled and straight cables. We would recommend a coiled cable rather than straight. The springy nature of the coiled cables will prevent you from accidentally pulling the headphones out during the performance which can damage the sensitive wires inside of the cable. Sometimes you will need to switch from the coiled cable to straight one, depending on your needs. It’s also a much cheaper solution to only change the cable rather than buy an entirely new set of headphones when the cable is damaged. The human beings can hear the sound ranging from 20Hz (low bass frequencies) up to 20kHz (high frequencies). Anything outside of this range is irrelevant because we cannot hear it and it’s usually a marketing gimmick rather than superior quality fact. The greater volume level can be achieved if the sensitivity (dB/mW) is higher. Be advised that the listening to the music at the high volume can damage your hearing, so it is best to keep it to a minimum or to use special ear plugs that can attenuate the harmful frequencies. For good and precise DJ monitoring it’s really important to have a good bass response in the headphones. If the driver diameter is larger you will have the better bass response. Most of the DJ headphones use a dynamic driver. Dynamic drivers are basically the mini version of the large drivers found in most of the speakers. The mini speaker in the headphones gives you clarity and a lot of bass without the need for additional amplification. The standard for most of the electronic devices and music headphones is the 3.5mm jack. With that being said, the most of the professional studio and DJ equipment usually require ¼ inch jack. Most of the good headphones will come with the adapter so you can easily switch between these two. When you are listening to the music at high volume, you will have less distortion if the input power is higher. The smallest amount of distortion can be achieved with an input power of somewhere around 3000mW, but the headphones with that kind of input power will cost a lot. This is very important because it allows you to use one ear for monitoring the master mix levels and the other for cuing which will allow you to match the beats perfectly while your hands will remain free for handling the equipment. Although it’s true that the heavier headphones are more durable, the lighter ones are more comfortable and they reduce the fatigue that comes with the longer mixing sessions. The best headphones will be made of high-quality materials that will be both durable and light. To find the fitting set of headphones that will also suit your budget you must first think about how often will you use them and in what kind of environment. But one thing is certain, the good headphones are the essential tool for every DJ and finding the fitting pair is a very important choice. DJs focus just on two main things: 1. Tunes and 2. a Pair of headphones. Every pair of them has its own strengths and weaknesses and thus no pair is absolutely the best. These are the Best DJ Headphones in use for this year. Pick a set of cans that are high-quality and long-lasting and you may not need to go in for another pair anytime soon. We hope you enjoyed this rundown, feel free to leave a comment and share this article if you did!